We had filled our quota for Boston and it was time to move on to the next city. Portsmouth, New Hampshire would be our first stop. I had been here before and immediately fell in love with the quaint coastal town. The cobblestone streets. The old East Coast architecture. The smell of salt water drifting through the air. Despite the depressing weather, I wanted to share this town with my mom. Unfortunately, it was not everything I remembered, solely due to the weather. Walking store to store we became drenched as the clouds opened up and let down sheets of rain. Off Piste is a small boutique on Congress Street. While talking with the owner, I had mentioned that I write for a food blog and she immediately began talking about this tiny restaurant in Portland, Maine. "The line may be absurd to get a table, but it is worth the wait." So with that, we climbed in our Toyota Prius and began the hour drive north to Portland. Food is something that is so easily taken advantage of. We eat to live. We eat because it takes good. But do we eat to appreciate the work and talents used to make a dish? As we walked up to the tiny window front of Duckfat we were met by a line going out the door. People were standing bundled up, hoods on, standing in the rain. Waiting. I glanced at my mom - "Are you kidding?" I said. As I walked into the small restaurant I was met by a young hostess welcoming people. The space was filled to capacity - there was barely enough room to stand at the hostess stand and put your name on the wait list. 1 hour was the wait. Shockingly, this was an incredible short wait time - I would later fine out that the typical wait to be seated at Duckfat was 3-4 hours. 3-4 hours to sit in a tiny restaurant. At a communal table. The hostess put down my name and said that they would text me when our table was ready. With that we began walking in the rain. Portland felt very similar to Portsmouth, although on a slightly bigger scale. Everything about the city screamed East Coast. From the architecture to the people to the steady rain and salty air. The wait only increased the build up around Duckfat. Had he owner at Off Piste sent us on a wild goose chase in search of a restaurant that would only slightly meet expectations? Or would the food truly be unlike anything I had ever had? I have been to many restaurants in my lifetime. Some incredible. Some less than satisfying. Others somewhere in the middle. But when I think about the food that I ate in Portland, Maine - the food at Duckfat - I am beyond impressed. French fries. Shishito peppers. What in the world could the chef have done to make something so simple, so ordinary, out of this world? If you can't tell, Duckfat lived up to, no, far surprised my expectations. Frying the potatoes in duck fat rather than other oils elevates this side dish to gourmet level. Add specialty dipping sauces and you're even further from the comparison to McDonald's. I would pay the $7.75 for these fries any day. Duck fat fried shishito peppers!? At the end of the day, the cue I took from eating at this restaurant is that you can fry any food item in duck fat and it will instantly become the favorite thing that you have ever tasted. No really, I dream about the duck fat fried Belgian fries and shishito peppers on a weekly basis. I've even decided that I need to go out and purchase peppers to fry myself. When it comes down to it, it is restaurants like DUCKFAT that make you appreciate food as so much more than just a source of sustenance. The creative minds that go into constructing a cohesive, thought-provoking, inspiring menu are incredible and ought to be celebrated. Whether you live on the East Coast, in the Midwest, or even on the West Coast, Portland, Maine is a city that must be visited. 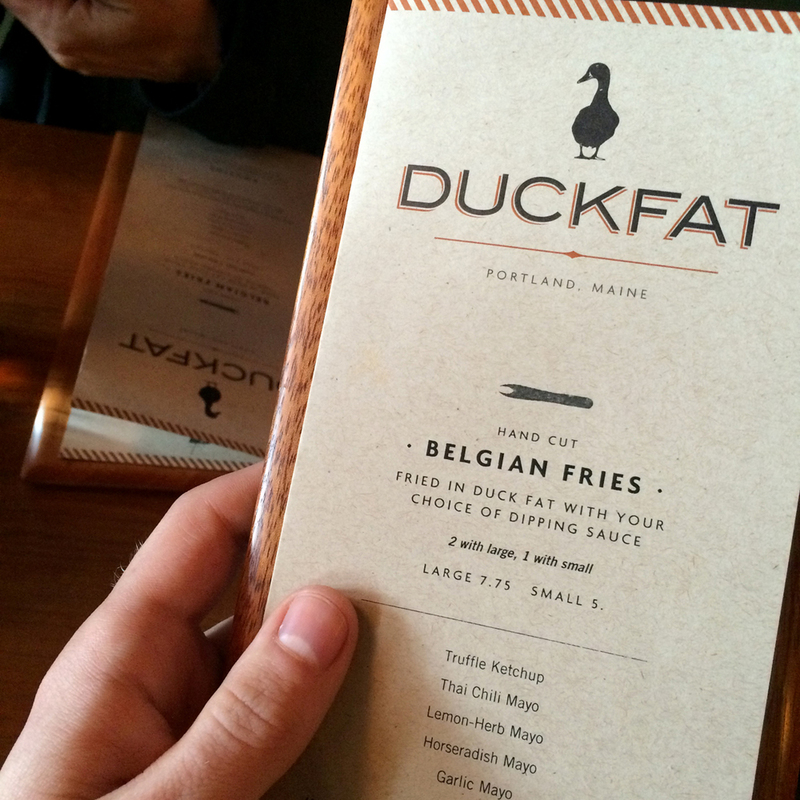 And Duckfat should be #1 on the list of restaurants to try while there.